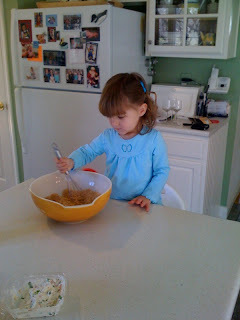 Today Alyce helped Mom and Grams make Christmas Cookies. Mom sent me a picture of Alyce helping out and I wanted to share it with everyone. Thanksgiving was very busy this year. The family had two meals to attend. The night before we traveled out to Grandma's house to help get the house ready. We didn't do much at night, but us being there in the morning made sure that we hit the ground running on Thanksgiving. Seeing my side of the family was great. My brother and his family were there along with all of my cousins who had kids right around the same time Alyce was born. It was very neat this year because all of the babies are now toddlers and they are beginning to interact with each other. You can definitely see the impact of the next generation. There was an entire table crammed with parents trying to get their children to eat something. The afternoon at Grandma's culminated with all of the kids and parents going down the hill to play on some playground equipment at the school. After dinner and the playground at Grandma's we had to load Alyce in the car and get ourselves to Gram's and Grandpa's house. By this point it was past Alyce's nap time and we were hoping that she would fall asleep in the car. Our prayers were only partially answered because she fell asleep the last 10 minutes of the drive. Luckily dinner was running late and I could stay out in the car with Alyce and we both took a little cat nap. Once both dinners were over we went back home, got Alyce into bed, and took a little break for ourselves. Alyce did great. We couldn't have asked her to be any more well behaved. Throw on little to no nap and it made her positive attitude even more impressive. 0 comments on "Making Cookies"